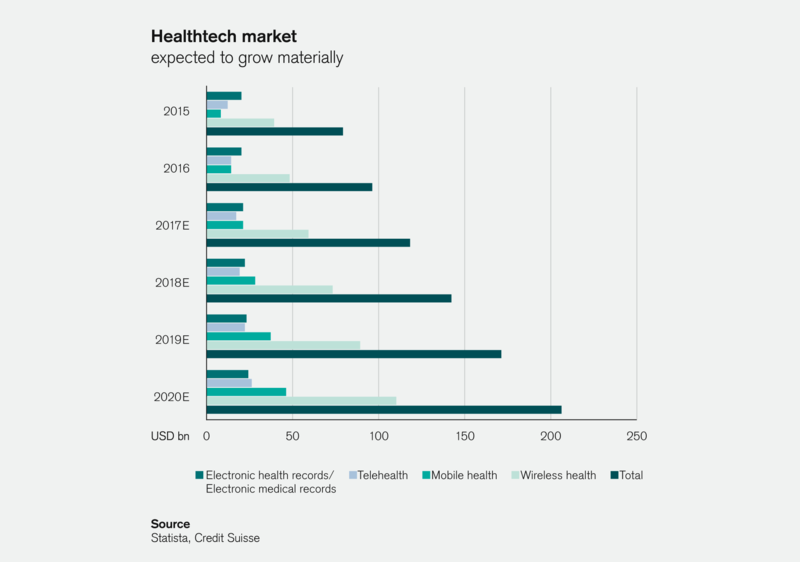 Thanks to strong growth and a robust outlook, the health technology market offers many opportunities for long-term investment. The global digital health market has been valued at 118 billion dollars worldwide, according to industry research firm Statista. It is expected to reach a size of 206 billion by 2020, driven in particular by the mobile and wireless healthtech market. Managing patient data, telehealth applications as well as fitness and wellness, and consultation or remote control solutions via smartphones and interconnected healthcare devices are all driving growth in this area. Thanks to the robust outlook for this sector, healthtech trends may prove interesting when it comes long-term investment strategies. In short, healthtech technologies help to improve health outcomes, be it through the promotion of healthy living, disease prevention and diagnosis or treatment and rehabilitation. These technologies include classic digitization solutions, the use of biotechnology, big data approaches or the use of artificial intelligence (AI) in healthcare research and development or delivery. With regard to digital tools, we have highlighted the potential for delivering care at a distance. It has been reassuring to see that Teladoc, a leader in virtual care delivery solutions (i.e. virtual visits through mobile/tablet/PC), remains on a strong growth trajectory. The company now expects close to two million virtual physician visits in 2018 – a doubling in merely two years. As ever more healthcare devices are interconnected, we see vast improvement potential ahead with regard to healthcare insights generated in less time and regardless of the geographical location of the patient or physician. Great strides have also been made in biotechnology with the development of gene therapies and technologies such as RNA interference. The approval of a gene therapy product for retinal disease from Spark Therapeutics just before the turn of the year was followed by a flurry of gene therapy data presented for products aiming to treat conditions as diverse as spinal muscular atrophy, hemophilia or phenylketonuria. Artificial intelligence (AI) has also made inroads into healthcare. The technology is now used by many companies in drug development (e.g. to mine databases to identify drug candidates) as well as in diagnosis. It comes as little surprise that medical image analysis is particularly important. In fact, research firm Tractica identifies this area as the most important use case in the healthcare AI software, hardware and services market, which it expects to reach USD 19.3 billion by 2025, making it a promising long-term investment opportunity.